STELLE Girls Canvas Ballet Slipper/Ballet Shoe/Yoga Dance Shoe (Toddler/Little Kid/Big Kid/Women/Boy)(8M Toddler, Ballet Pink) | What Should I Say? 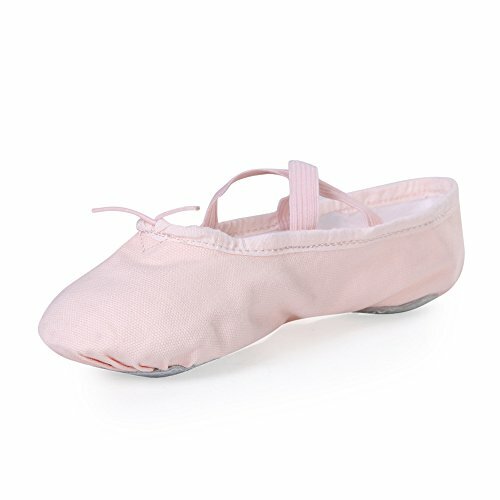 Our split sole canvas ballet slipper is high quality ballet shoes that meet professional standard. We have 20 years experience in professional ballet/dance shoe making. Our slippers use the high quality cotton material as the top part, which is hand washable. The slippers are professionally designed that they fit your feet very well and are very comfortable. What you need to pay attention is to pick the right size for your child(ren) or yourself (Ballet shoe sizes are generally smaller than street shoe sizes) . Lightweight slippers to let your feet breath. Very comfortable. Recommended by professional ballet instructors. Refer to the shoe size chart in images for proper sizing. Dance shoes are supposed to fit close to the foot, they aren't supposed to fit like regular street shoes. Based on passed customer reviews, please order one size up. For kids younger than 5 years old, please order Toddler 5M to Toddler 10M;For kids between 5 and 10 year old, please order Little Kid 11M to Little Kid 3M;For kids older than 10 years old/Women, please order Big Kid 4M to Big Kid 8M. Big kid sizing is the same as women's sizing. If you have any questions about this product by STELLE, contact us by completing and submitting the form below. If you are looking for a specif part number, please include it with your message.